After an 8am breakfast in Moshi, drive in the Buffalo Tours Land Rovers for just over an hour to Marangu Gate. During the drive, pass through scenic villages and coffee farms. At the gate, meet the Buffalo Tours porters, guides, and cooks that will spend the next six days trekking with you. Registration and final preparations usually take about an hour. After all the paperwork is finished, you will begin hiking with your guides to Mandara Hut, day one's destination. For the majority of the day's trek, you will walk along a narrow trail through the rainforest of Kilimanjaro. The trail follows a mountain stream and you will hear and possibly see small waterfalls through the trees. While walking through the forest, enjoy the sounds of primates and birds and see many different species of trees, plants and flowers that thrive in the diverse environment. Eat a picnic lunch at Kisambioni, the day's halfway point. After lunch continue walking through the rainforest for another 1.5 hours to Mandara Hut. You will reach the hut at approximately 2pm at which point you can rest until dinner or take a short walk (fifteen minutes one way) to the wildflower-covered Maundi Crater. The views to the east over Taveta and to the northwest to Mawenzi Peak are stunning, making the short hike well worth the effort. The A-frame Mandara Huts can accommodate up to seventy people and consist of several sleeping huts and a dining area. All of Marangu's huts have beds with mattresses and pillows. During high season, the huts can be crowded and you may have to wait your turn to eat dinner in the dining hall. After a hearty breakfast, leave Mandara Hut, and Kilimanjaro's forests, for Horombo Hut. Most of day two's hike passes through bleak heather and moorland. The soil is rocky and the vegetation consists of grasses, heather and several species of wildflowers. You will cross several small bridges astride seasonal rivers. Eat a picnic lunch at a spot called Kambi ya Taabu before continuing on to Horombo Hut. If the weather is clear, you will have many excellent views of both Mawenzi and Kibo peaks. Arrive at Horombo Hut at around 3pm and spend the rest of the afternoon relaxing. 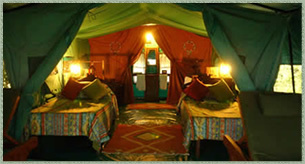 Although extremely busy, the Horombo Huts are considered to be the nicest lodging on Kilimanjaro. The small, A-frame buildings can accommodate up to eight people each and provide lodging for hikers ascending, descending and acclimatizing. Horombo can accommodate up to one hundred hikers and many more porters, cooks and guides. There is only one dining hut at Horombo, making meal times a bit hectic. Day three will be spent acclimatizing and exploring the area around Horombo Hut. Buffalo Tours suggests hiking all the way to Mawenzi Hut to allow for greater acclimatization. You will not only increase your chances of reaching Uhuru Peak, but you will also be rewarded with magnificent views of Kibo. You will return to Horombo for a late hot lunch. Spend the afternoon and evening relaxing at Horombo. Leave Horombo Hut after an early breakfast to hike through the moorland and alpine desert of Kilimanjaro's upper altitudes. After about an hour of hiking, you will come to Maua River, a small mountain stream. If you are carrying a water filter or water purification tablets, fill up your water bottles here; the only water available above this elevation is brackish. After Maua, the terrain becomes flatter and the vegetation begins to disappear. The wind picks up and the hiking becomes less enjoyable. Break for lunch (and a much needed break from the wind) at Middle Red Hill. After lunch, continue on a steady incline for another two hours through the Saddle. Although the environment on the way to Kibo is bleak desert with little vegetation, you will see many stunning views of Kibo and Mawenzi peaks. Reach Kibo Hut around 3pm to rest and prepare for your midnight climb. The Kibo huts are made of stone and are not very warm. Make sure you have a four-season sleeping bag or a three-season bag with an extra sleep sheet. Most hikers experience some of the effects of altitude sickness at this point. Be sure you are aware of altitude sickness symptoms, and if you are feeling very sick, please tell your guide. At midnight your guides will wake you up for your climb to Uhuru Peak, the roof of Africa. Your hike begins with a five-hour hike to Gillman's Point on the crater rim. Although this is considered to be the easiest of the three crater ascent paths, it is still extremely difficult and the chances of getting sick or turning back are high. The first major rest stop, William's Point, lies at 5000 meters and is just under two hours away from Kibo Hut. You will need to drink water and eat a snack at this point. Continue on for thirty minutes before beginning the rocky switchbacks that will continue to Gillman's Point (5,681 meters). The trek from Kibo Hut to Gillman's Point takes approximately five hours and is the most physically demanding part of the summit hike. After reaching Gillman's Point, rest for a few minutes and then continue on the crater hike towards Uhuru Peak. The rest of the 1.5-kilometer hike is a gradual climb and, as far as hikes go, not very difficult. The altitude, however, makes the going a psychological battle and you will need to proceed very slowly, and be very stubborn if you want to make it to the top. The guide will let you know what to do to make your climb easier. If the guide says you need to turn back, you must listen to him or her! During the crater hike, you will pass by several glaciers. Although you will not be able to see the glaciers on your way to the top, you will see them on the way down. The crater rim hike takes about 1.5 hours and you should reach Uhuru Peak around sunrise. Take photos of your guide and group at the peak before beginning the descent to Horombo Hut. On the way down from the summit, you will see all of the magnificent views you could not see in the dark. Pass by the crater glaciers and rock formations, knowing that you are returning from the summit of the world's highest free-standing mountain. Stop for some tea and a short break at Kibo Hut before continuing on to Horombo Hut. Reach Horombo Hut in the afternoon and enjoy your last night on the mountain. After breakfast you'll finish the trek with a descent through the rainforest to Marangu Gate. A Land Rover will be waiting at the gate to take you back to Moshi, where you'll need a hot shower and hotel stay. You will meet your mountain staff in town to say a final farewell and distribute tips.